All recordings below are available from the Porters' Lodge, on + 44 (0)1865 279800 or from steward@lincoln.ox.ac.uk. Our other CDs include Magnificat and Peace in our Time, both of which may be bought directly from Guild Music (www.guildmusic.com) or from the Porters' Lodge. Released in November 2013, For the Fallen, marks the centenary of the First World War, in which nearly 500 Lincoln alumni served in the armed forces. Directed by Joseph Mason and accompanied by James D'Costa, the recording features Victoria's Requiem as well as works by Douglas Guest, Alonso Lobo, Charles Villiers Stanford, William Henry Harris and Paweł Łukaszewski. ​It is available for purchase from the Porters' Lodge, or online from iTunes, Amazon, Spotify and CD Baby. If you would like a copy sent to you, please get in touch with Lincoln's development office by email. ​You can also listen to extracts on our youtube promotion video here. The Voice of My Beloved was directed by Paul Wingfield and Rebecca Taylor played the organ. It is a recording of various settings of texts from the Song of Songs ranging from the Renaissance to the present day. Settings by Orlando Lassus, Patrick Hadley, as well as recent works by John Caldwell and Richard Pantcheff. 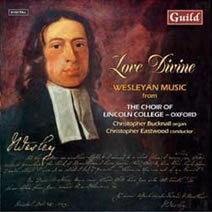 Love Divine is a collection of Wesleyan music to celebrate the tercentenary of the birth of John Wesley, who was a Fellow of Lincoln. 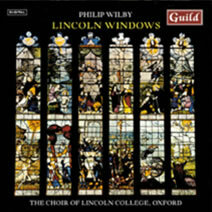 Released in 2002, Lincoln Windows includes a commission for the choir that takes as its inspiration the typology of the East Window of the chapel. 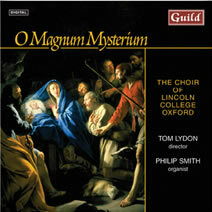 Released in 2001, O Magnum Mysterium includes an interesting and varied collection of music for the Christmas season. In March 2001 the choir supplied the chorus for the world premiere of the opera/oratorio The Word, by John Caldwell. This follows on from Caldwell's earlier work, Good Friday, our recording of which has also been released on CD by Guild Music.